cdcindonesia.com - In the morning, all the job seekers, here are information about job vacancies that come from one of the oil companies that is one of the subsidiaries, namely:PT PGN LNG Indonesia - PGN LNG is a business entity in Indonesia running business in the field of Liquefied Natural Gas (LNG). PGN LNG is a directly owned subsidiary company of state-owned gas utility company PT Perusahaan Gas Negara (Persero) Tbk (PGN Group). 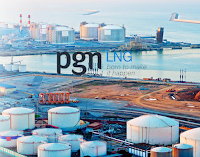 PGN LNG was formed in 2012 with main objectives to develop LNG business within the PGN Group which consists of natural gas liquefaction, LNG storage and shipping, and natural gas regasification to support PGN Group's main business in gas transportation and distribution to consumers. Since July 2014, PGN LNG has Foating Storage Regastification Unit (FSRU) located ± 21 km offshore from Labuhan Maringgai - Lampung with a capacity of 1.5-2 MTPA with a shipping limit of up to 250 MMSCFD. PT PGN LNG Indonesia is based in South Jakarta and its principal office is located at Graha PGAS Building, 7th Floor Jl KH Zainul Arifin No 20 Jakarta 11140. Possess certification in Ahli Nautika Pelayaran ANT 1, preferably possess certification in Pandu / Mooring Master Class 1. Carry out Pandu / mooring masters class 1 activities. Terminal Operation, preferably as a Marine Terminal Superintendent in the field of oil and gas. Familiar with Microsoft office and internet. Able to coordinate well with internal and external parties. Have high integrity and able to work in a team. Note: Bagi anda yang berminat bekerja di perusahaan energi seperti PT PGN LNG, hanya untuk lebih memahami, membimbing, mendapatkan informasi perusahaan energi (oil and gas) , silahkan daftar disini. Closing date 30 November 2018.Please mark code of the position applied at the email subject.All applications are appreciated and will be treated confidentially.Only qualified, short-listed applicants will be invited for furthers process.